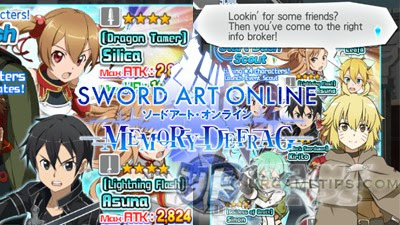 Here's a quick FAQ, Tips, and Re-roll Guide for the action RPG mobile game Sword Art Online: Memory Defrag, now available to download from the App Store and Google Play! - 3* Random character from the "Free Scout". - 4*, 5* or 6* Free Character depending on the current event or if available. - If these are the only characters you have, I suggest you do re-rolls and aim for any strong 4*~6* character, or if a free 4*~6* character is available, then you may continue if you wish. - Earn your first 250 Memory Diamonds and try your luck! - Refer here to get an idea which characters are highly recommended (also for hard re-rollers). - Complete the specified Quest to obtain the featured Character. Make sure to check the Event Notice or the Missions Tab for the specific "quest title" that you need to complete (usually Quest Story 10). Some events will also require you to achieve a number of Event Points. - Create or join Co-Op Battles if needed, to makes things easier. Best if you have a strong friend or ally that can Heal. For all-out offensive teams, try to rush, create fast combos and take down the enemy (with skills) as often as possible! - If your character dies, do not "Give Up" or "Revive", just wait and watch, because your party might still win and you'll still get those completion rewards from the missions tab! - 4* have higher overall Stats, Max Lvl, number of Battle Skills (bonus stats +%) and more. - 5* are like 4* units but have special features like Leader Skills and Combination Attacks with certain partners. - 6* are like 5* but have exclusive features like Acceleration Skill that can slow the timer while doing SS3s, also have an additional Sub Leader Skill. - This is an optional method, but still recommended especially for F2P players. - Get your free Memory Diamonds from the Daily Bonus and Special Bonus. - Go and follow the Story-line Quests until around Chapter 2-2, continue if you need more. - Also complete the Daily Missions and other easy tasks from the Missions Tab. - Claim them all from your Gift Box. - Free random 3* character, with 4% chance to draw a 4*~6* character. - 4% chance to draw a 4*~6* character, scout once or twice. - In case you just want to settle on a 3* character to fill up your team, then just scout once or go twice. - Android: Just go to "App Settings" and select "Clear Data" under your SAO MD app. - Only follow the usual method of re-rolling above, any other method that will allow you to skip any part of the tutorial in-game will get your account banned after a few days! - It is also recommended that you avoid linking in too many re-rolled account into 1 Google account for example, to avoid getting banned. - You can also earn 250 Memory Diamonds and pull the 11x Scout option. This is gonna take a while but the chances of getting 4*~6* is also a little bit higher, since you'll do multi pulls+extra. - If you want to try this method, I suggest that you aim for at least 1 high Ranked character depending on the available banner scouts. - Use it for the 250 "Scout Option" to get 1 extra Free Scout, and hopefully another 4*~6* character. - Wait and use it for the limited banner events that gives higher chance rates to certain 5*~6* characters (that you might like). - For F2P players, it is also best to always save around 300~500 MDs for the "guaranteed 5*~6* character Scout events" (this is a rare event though but it does happen). - If you want to save your current account and continue re-rolling using a new account, then you need to use the "Data Transfer" option. - This will also allow you to transfer game data to a different device. Note though that when transferring data to a different OS, Memory Diamonds will be lost. - Go to "Other" on the menu and select "Data Transfer". - Take note of your data transfer ID and then set a password (make a screenshot too). - On your device (or other device), select "Support" once the Title screen show up, then proceed to Data Transfer to restore your saved account. - You cannot transfer data between different regions! - So if you are playing under NA version, you can't transfer your data to EU or ASIA versions. - If you are having error while transferring data, even if your codes and password are correct, then this might be the problem, download and try other versions until you are able to log-in and play. - Watch out for these limited events where you can get new characters, equipment, and other freebies! - The more difficult the quest you challenge, the rarer the items you can get. - Choose a high Lvl character to assist you on your next battle. Select the "Back" option then re-enter to refresh the list. - Note: If you select "Retry" after a stage completion, you'll still be able to use that same Supporter again and again, but if you end it, you'll need to choose another Support for the next battle. - If you choose to Follow a player, he or she will appear under your Support list. - Follow high Lvl players to make things easier (check their stats too). - You can play some event quests with your friends nearby as well as other users all around the world. Play with other players and clear quests more easily! - You need at least 1 player ally to start a Co-op match. - When joining a Co-op match, just hit "Ready" to ready up your character. - Get free 5 Memory Diamonds for every new player you play with in Multiplayer Mode! - Note: The first Matching Bonus is only limited to the first 20 players you play with. - Here you can get materials that can be used to unlock Attributes and used at the Blacksmith for upgrading gears. - The more difficult the quest you challenge, the rarer the materials you can get. - Europe = UTC; US = PST; Asia/Pacific = JST. - Urgent Quests appear out of the blue and are available for only a short period of time. - One of the best ways to get fast EXP and EXP Potions for your characters! - For this event, take out all Ragout Rabbits before they escape, to get more battle EXP and EXP Potion drops. This applies to other extra quests as well. - The more difficult the quest you challenge, the higher the EXP you can get. - Note that the game may also change the time schedules above. As much as possible, heavily invest your resources on your 5* and 6* characters. 4* and 3* characters are ok, but only if the items required to upgrade them is easy for you to farm. - Characters with higher rarity cost more to put in your party, but as your rank goes up, so does your team cost limit! - Simply add them to your party to gain EXP. Note that all characters in your party will get 100% EXP each. - Enhance characters using EXP Potions (check under "Party" section in-game). 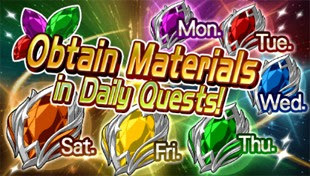 Check "Urgent Quests" section above for more info on how to farm EXP potions and gain fast EXP. - Farm, Decryption Keys, Shards and Crystals to upgrade your character's attributes. - Note: Some limited event FREE characters will require a different set of Crystals, obtainable only from limited event quests. - Used to unlock attribute enhancements, making more enhancement possible. - All Characters can get their 3rd Sword Skill, once they reach Lvl 50. Unlock and activate the Lvl 50 SkillLv:+1 by following the Critical path then to the Skill path. - After performing a Limit Hack, you can choose to increase Attack, HP/Defense, or MP. - You can change the stat whenever you like, but you need to obtain the requirements again. - Highly recommended that you only do this to your core 6* or 5* characters, to increase their Max Lvl to up to Lvl 100. - Required items for Limit Breaking your characters. 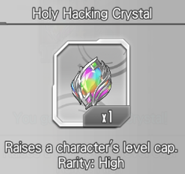 When scouting characters, if one you already own appears, you can receive Hacking Crystals instead. The number of crystals received depends on the rarity of the character. - More info about Limit Breaks can be found here: SAO: MD - Limit Breaking and Which Stats to Choose. - Will naturally get a higher max stats than farmable ones. Example: A 3* Gacha weapon is still better than a 4* farmable weapon. Where To Farm Free Weapons, Armors, and Accessories? - As your progress through the story line quests, you'll eventually encounter stages where you can randomly get free equipment from treasure chests. "Tap and Hold" when browsing Chapters and Stages to check. - Although these items are free to farm, their stats are really bad though. - Recommended Source: Limited Time Event Quests (Extra Quests). Check the featured event if you can farm some free 4* equipment for your characters. This is your best choice for weapons for now, until you can get a better one from the Gacha Scouts. - Note: The faster you complete a quest, the higher your completion rank will be, allowing you to get your hands on higher-ranked bonuses! - Once your inventory can't handle your items, just sell your gears that can only reach 1* or 2* when maxed. Gears that can be maxed to 3* are OK, but sell what you don't really need. - Keep all farmable 4* gears, but sell those extras ([R2] versions) that you no longer need. - Keep all Gacha gears that can reach 3*, 4* or 5*, you'll need them all for various events. - If you need more space, upgrade your inventory using Memory Diamonds. - Use the Gift Box as storage too (do not claim items), but watch out for the expiry dates. - You can increase a character's stats by equipping armor and weapons of the character's own element. The elemental bonus works for all equipment across all elements (Fire, Water, Earth, Wind, Holy and Dark) and also non-elemental equipment. - The bonus is 1.2x of the original stats. - Some equipment carry battle skills, which automatically activate in battle, resulting in certain effects, for example, an attribute boost. - You can use Col and materials to upgrade equipment and increase it's stats. - As much as possible, only upgrade gears that can be evolved up to 4* or 5*. - Max Lvl 10; Requires 1 Copy (same name) regardless of Lvl. 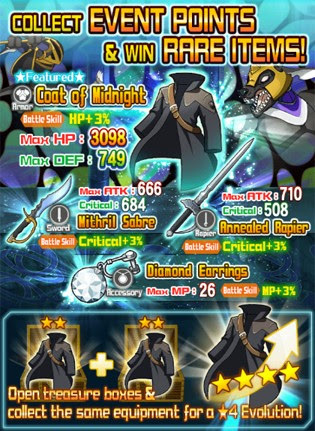 - So if for example you have a 2* Coat of Midnight [R2] gear that can be evolved to 4* [R4], this time you actually need 11 more pieces of 2* Coat of Midnight [R2] in order to evolve it to 4* Coat of Midnight [R4].